"David and Valerie Astill clearly have a gift for making friends... and were privileged to attend a number of local ceremonies and events such as the candomble in Salvador de Bahia, an important religious ceremony in honour of the gods, which very few tourists have experienced…Valerie Astill’s descriptions of adventures, landscapes, costumes and local customs are detailed and picturesque. Her book also includes many photographs, sadly only in black and white." "A nice travelogue, honest and lightly written. It’s warts and all, “The entrance and archway dating back to the 16th century had obviously been used more recently as a public convenience. It smelt dreadful…” If you want an insight into travel through Brazil, Peru and Bolivia, this will give you what you’re after." 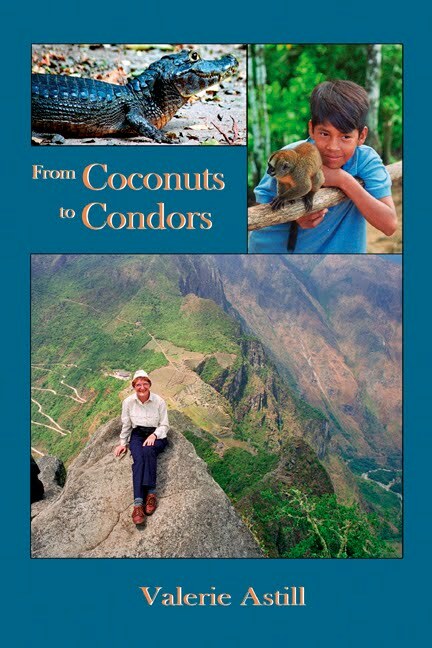 "As a fellow traveller to the Andes, I have much enjoyed 'From Coconuts to Condors'. I don't actually mind the photos being in black and white, as I can visualise the locations from Valerie's excellent descriptive writing. I have also enjoyed the fact that the book is well written, in the correct tense, and with proper punctuation! Having only been to Peru, I now want to visit both Brazil and Bolivia! Thank you Valerie." "We enjoyed this book because it conveys the reality of travel in these countries and the everyday issues facing the traveller. Too many travel books tend to present a 'tourist board' image of a location which is very different from the practical experience of the average visitor. Problems, hiccups and the unexpected help one to understand and appreciate a country much more. This is why the lack of colour photos doesn't matter. This book is a real journal of an exciting and challenging venture and not just a 'puff' for the South American tourism industry. Well worth reading." Sounds like a wonderful read. Travelers will surely find this book very interesting. Thank you for your contribution. The book is an enlightening travelogue.